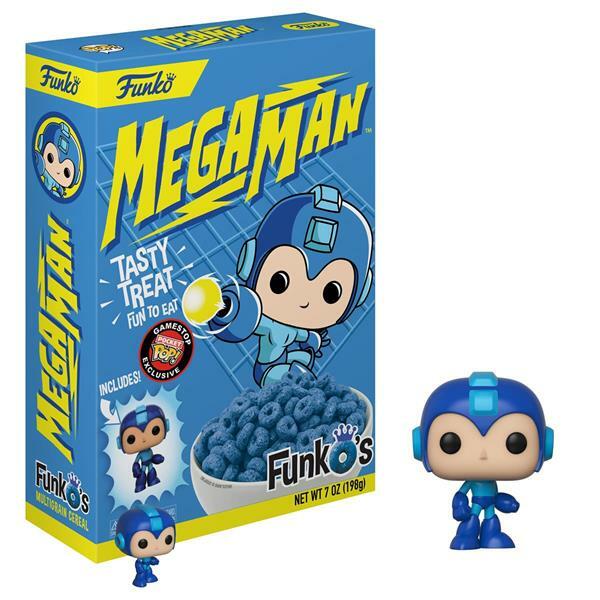 Later this month, Funko are rolling out boxes of Mega Man cereal to GameStop. Inside you'll find blue colored, multigrain "FunkO's" and a miniature Mega Man Pocket Pop figure. The backside of the package will feature Mega Man-themed puzzles, activities, and games. One box will set you back $7.99. Bit of a cute novelty, no? I'm not the biggest Funko fan (I'm really not) but this is something I might toss into the 'ol Mega Man collection. More details and images of complete FunkO's line (yes; there's more) via BleedingCool. That's weird. I wonder why they couldn't use the design for the Mini-Funko version that was in the Retro-Arcade line. That one looks better than the original Funko Pop Mega Man. Because this is their mainline Funko pop design, like it or hate it. Only a 7 oz. box? I wonder how much of that is taken up by the figure. The eyes. The soulless eyes follow you everywhere. First it was looking at Funko. Now it's eating Funko. Next it'll be breathing Funko. Until we are all turned into empty husks like their signature figures. I honestly had no idea there even was a Funko cereal (anyone know if it's any good?). Anywho, not a huge Funko Pop fan personally, but the tiny Megaman figure is kinda cute. Might pick this up if I see it. I… kind of want this. Just for the cereal, though. The cereal looks kind of tasty. My favorite expression is "I don't give a Funko" when it comes to these figures but that cereal may actually get me to pick up a box.I may actually have a Funko to give about this. I am stealing that line. All American cereals are strange and gross, sorry. YUCKY! And this MegaMan is so-so looking and weird at the same time. ....sorry, what? Video game store exclusive CEREAL? I'm out. if i come across this in the store i go to buy collectible, figures and stuff, i might pick it just for the sheer strangeness of it. otherwise, i pass. What vision of hell have you brought upon us, Funko? !